The day after spending the whole day i Disney we took a trip to Universal Studios. We bought a Park-to-park ticket so we could go from Universal Studios and Adventure island as we wanted and well.. take the Hogwarts express from park to park. I have to admit i was there mostly because of the Harry Potter World which was spread out in both the parks. In the Universal Studios park we saw Crustyland like in The Simpsons, some kind of Dapper land with blues drummers and Shrek. We went to find the Hogwarts Express. We met a guy working near "the Kings Cross station" and he told me that i could take the train, or i could continue down the street we were on. Sure thing and we saw the Nightbus and all but then... we went into something that looked like a wall? 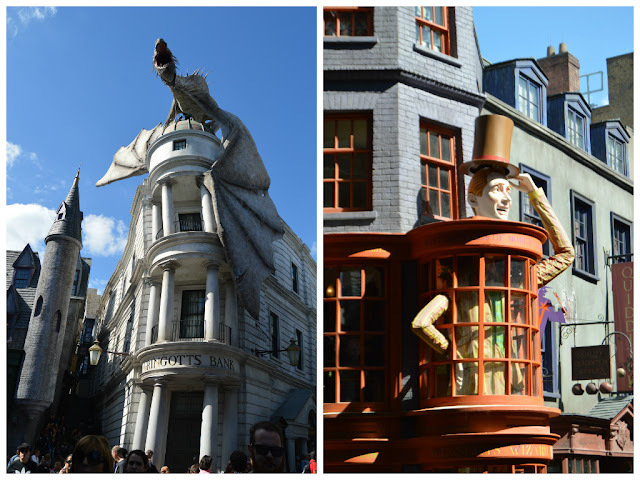 It was a little weird but on the other side... Diagon Alley! And i have to say... I cried... a whole lot. It was magic and i couldn't take a picture that described how awesome and beautiful it was to see, if you are a huge Harry Potter fan. And i am very sorry Kristina, that you had to witness that. But i went into every single store in Diagon Alley even though most of them had the same things. I tried the Gringotts ride which was with amazing 3D effects. I can't describe how awesome it was. If you are just a little fan of Harry Potter DO IT. After that we went to the Adventure Island with the Hogwarts Express whivh was crazy awesome as well. Instead of having the view of just trees on the way there, they showed the sceenary that are showed in the movies and Hagrid flies pass on his motorcycle. And on the close to see through doors we got a visit from the Dementors but was saved by the shadows of Harry Potter and his friends. You could hear them talk as well. As you step out on the Adventure Island you step right out in Hogsmeade and this time i DIDN'T CRY ok. But it was a snow landscape and i bought a Pumpkin Juice to go (not good though) and went through the street until i came to Hogwarts. We were there on Valentines day, so there was long queues everywhere so you could stand there and see everything and take pcitures of all the magical Harry Potter things that was around you. The portraits were talking and Dumbledore was in his office and Harry and his friends were in the classroom which looked exactly like in the movie. The Hogwarts ride again was amazing. You were fliying through a quidditch game, had a dragon chase you and you went through the forbidden forrest before you fly over the lake to the castle again. It was beautiful! All in all a really good day for me and my Harry Potter heart!